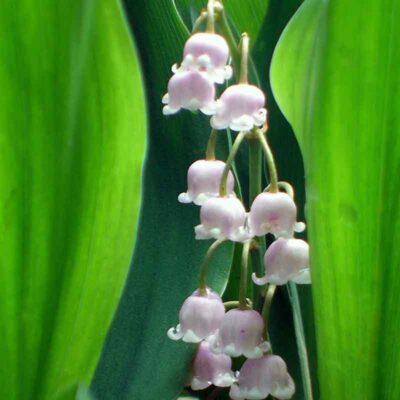 This rarer version of lily of the valley has the same beautifully fragrant bell-shaped flowers as the more common variety, but in soft pink. Blooms early spring (March or April) and, when picked, makes a very sweet spring bouquet. Plants form a dense weed-barring groundcover in part shade with large ,deep green, straplike leaves. Can be grown in full sun, but will need moist soil to keep foliage looking fresh. Toxic if eaten. Height 8-9″. Deer and rabbit resistant. Zones 3-8.